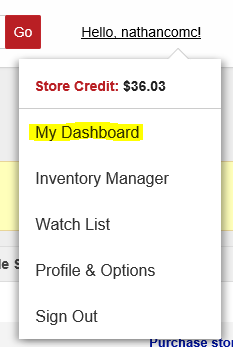 COMC Store Credit has many uses on our site. You can use it anywhere on COMC to pay for the processing of consigned items, shipping items in your inventory, submitting cards for grading, and running promotions. Store Credit can either be obtained by selling cards on our site or by purchasing the store credit by check or money order, or through PayPal with a credit or debit card. Sign in to your COMC account. If you are just signing in now, you will be automatically moved to your COMC Dashboard. If you are not on this page, you can get their by clicking on your username on the upper right hand side of the screen and choosing My Dashboard.